Women make up the majority of donors on #GivingTuesday, according to new research by the Women’s Philanthropy Institute released today. In an analysis of charitable giving records over 20 months, researchers found that while women represented 51 percent of overall donations made during that period, they contributed 63 percent of the total number of donations on #GivingTuesday 2016. The Women’s Philanthropy Institute (WPI), a leader in research about the effects of gender on charitable giving, investigated how women’s and men’s giving patterns on #GivingTuesday differ. The new study, Gender Differences in #GivingTuesday Participation, found that while women make more #GivingTuesday donations, women and men give approximately equal amounts of money on average and tend to give to similar types of organizations on this designated day of giving. The study, which is funded by a grant from the Bill & Melinda Gates Foundation, also offers recommendations for how organizations might use these findings to guide their fundraising campaigns. 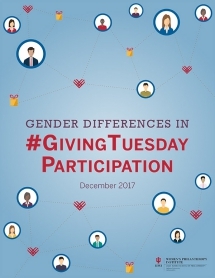 Research from WPI and other institutions suggests some possible reasons why women are more likely than men to participate in #GivingTuesday, including: women are asked more often for donations; women are more likely to use social media and spend more time on their cellphones; women participate more in collaborative giving, such as giving circles, and distribute their giving more broadly; and women volunteer more often than men. #GivingTuesday provides a unique opportunity for organizations to incorporate nontraditional fundraising methods into their efforts and to engage with donors online. From the study’s findings, organizations can find ways to benefit from women’s already strong participation in #GivingTuesday and increase giving overall. Coming on the heels of a record-breaking $274 million raised on #GivingTuesday 2017—a 55 percent increase over the amount raised in 2016—this latest research suggests that participation in #GivingTuesday will continue to grow, highlighting the importance of understanding gender differences in giving habits and using new tactics to maximize giving on this day and beyond. This innovative movement also proves to be a valuable case study for how women are driving philanthropy across all sectors.